Firstly and simply, we have the Faves – a simple MIDI controller that allows for 6 presets to be accessed on the fly. 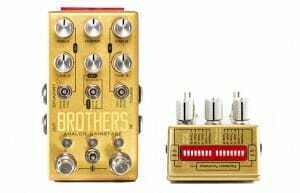 Perfect for adding some presets to your Chase Bliss pedals, without lugging around a bulky MIDI controller. But to more interesting pastures…. 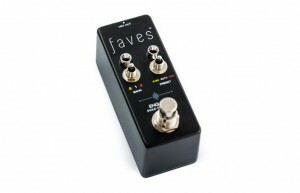 A first for Chase Bliss – not a modulation pedal! Here’s an interesting one. The Iconoclast is a stereo speaker emulator with a parametric EQ – Lows control the size of the virtual cab, Mids change the way the ‘speaker’ reacts to the ‘amp’, while Highs affect the cut-off, to emulate a wide range of cabs and speaker type. With high headroom stereo inputs/outputs, that can be used either balanced or unbalanced, the Iconoclast is designed to be placed after almost any pre-amp or pedal setup without introducing any undue clipping. It also has a headphone out, for quiet practice, and handily a built-in gate to clean the input signal up a little bit. The dual outputs mean that yes, you can output directly from your pedalboard to a mixer, powered speakers, or an interface – and in stereo as well! All it requires is 9V, though it can use 12V as well.